About: ‘A Brief History of Burning Man’ is a short historical novella that will be published on this site in serial form over the next several weeks leading up to the Burn of 2011. All chapters of the book can be found here as well as the front page. Up and down. Sideways. Left to Right then cascade like Atari’s logo motherfuckers. Now real fast Diagonal. Up again. Then over. Then back to the center then DOUBLE DIAGONAL! One in purple changing to white the other red turning into wait for it, wait for it OMG OMG Orange! Such a lovely orange. 1976 – Soup, Marc Allie & Ilia meet up at a Bob’s BigBoy in Burbank and decide over a Decadent Hot Fudge Cake and a side of Onion Rings the time is right to re-unite the Bumble diaspora in a mass ceremony to take place in Korea. Several diners and two short order cooks The Buffer and Quayle overhear the conversation and go on to play leading roles in the development of Modern Bumblepuss as well as discovering solar power and radium. This sumptuous, delicate dish is surprisingly easy to make and the perfect meal to prepare for the set-up crew in the days leading up to that event north of Reno. 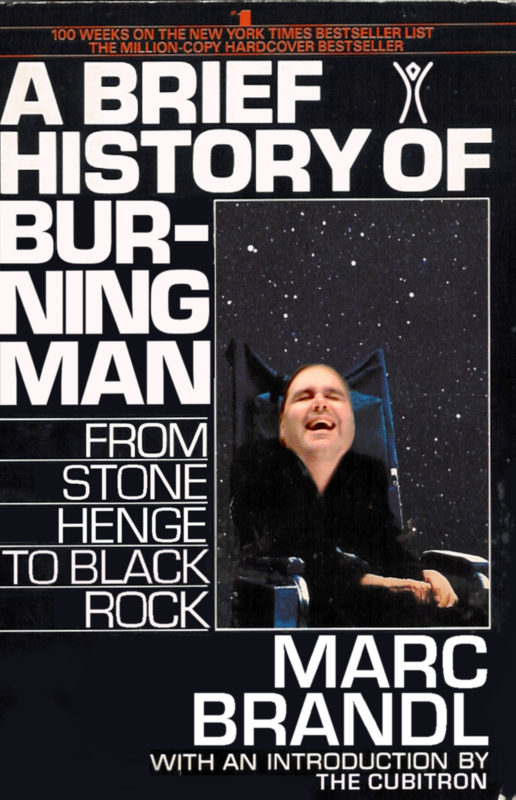 The Alternate Unabridged Version of Our people, where Burning Man Originated and how to roast an apple without getting your feet burned. The night was one of the full eclipsed moon circa 2539 BC when the idea first hit our historical godfather’s ancestor le Gizzle del Pete…who was a dope gangsta style version of your classic Roman emperor, and the chief of the nomadic goat herding tribe the ~Umbfus’ious of Nec’ar V”lleege. It was an ancient people who’s history could go back farther, but to what end, for Gizzle was the dopest chief off that ever made history. BACK YOU RABID BUMBLERS! YOU MUST WAIT UNTIL THE EGGS ARE DONE! Oh, whoops, the eggs exploded in the boiler. I guess I should share my recipe for strained eggs. History when done well is rarely understood. All we can do is sit back and marvel at it. Understandable – thanks for reading it!